Sufjan Stevens will be releasing a special 10-year anniversary edition of Illinois this upcoming spring, just in time for the 11-year anniversary of the critically acclaimed album’s July 2005 initial release date. The new version will feature remastered versions of the songs, as well as new cover art updated by original artist Divya Srinivasan. Early editions of the cover featured an image of Superman flying over the Chicago skyline while a guy in a pinstripe suit who is probably supposed to be Al Capone cheerfully smokes a cigar in the foreground. Unfortunately, the use of the iconic Kryptonian was never cleared with DC Comics, and Stevens’ record label Asthmatic Kitty ultimately decided to replace the superhero with a bunch of anonymous, but equally heroic, balloons. 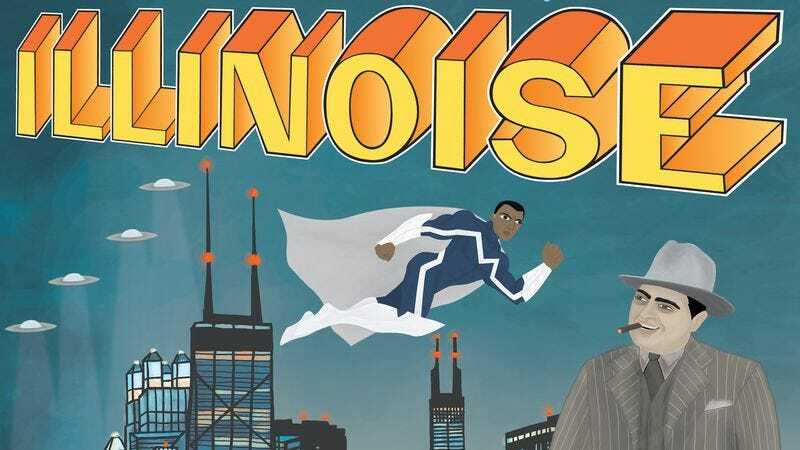 For the new edition, Srinivasan replaced both Superman and the balloons with an image of Blue Marvel, a Chicago-born superhero, for whom the record company did this time obtain permission from Marvel. The 10,000 pressed copies of the new edition will go on sale November 24, and are currently available for pre-order.